This is a collision between two very different styles – the one loose and informal (chaotic, even!) and the other tight, formal and rigid. And yet, it works really well here forming an almost year-round, green-screen between a large drive area and the entrance path to the house. The border is fairly narrow (1.2m) which restrained my range of plants. 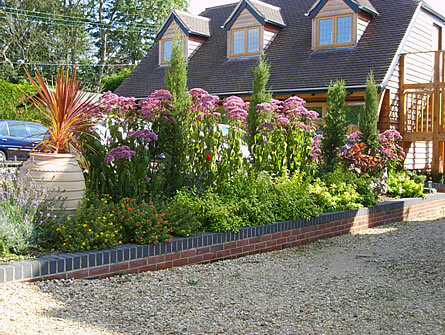 I wanted a layered effect so I used different planting groups to create strong horizontal bands. This raised bed has only about 30cm of good quality soil (heavily improved before planting) before you hit builder’s rubble. It is on the eastern side of a large building (out of picture towards the right). The bed was planted up in October 2006 and this picture (at left) was taken on 4th September 2007. The focal point plant (Trachycarpus fortunei) was replaced by Cordyline austrralis in the spring after severe wind damage. The site is windy and exposed. Also Cotinus coggygria ‘Grace’, positioned opposite kitchen window. And Dahlia ‘Bishop of Llandaff’.